Fabrizio Nevola did his undergraduate degree in Modern History and Italian at University College, Oxford and MA (History of Architecture) and PhD (History of Art) at the Courtauld Institute of Art. He has held research fellowships at the University of Warwick, the Canadian Centre for Architecture (Montreal), the Medici Archive Project (Florence), and Harvard University's Villa I Tatti (Florence). He specialises in the urban, cultural and architectural history of Early Modern Italy, and has also developed a strand of research on the street life of contemporary urban environments. He was involved in the exhibition at the National Gallery in London, Renaissance Siena: Art for a City (October 2007- January 2008) and is author of Siena: Constructing the Renaissance City (Yale University Press, 2007) as well as a number of edited volumes, including Locating Communities in the Early Modern Italian City (2010), Tales of the City: Outsiders’ Descriptions of Cities in the Early Modern Period (2012) and Experiences of the Street in Early Modern Italy (2013). In 2008 his book, Siena: Constructing the Renaissance City was awarded the Royal Institute of British Architects, Sir Nikolaus Pevsner International Book Award for Architecture. In a number of recent research projects that have explored the use of mobile phone apps for different aspects of narrative and history, he has worked with specialists in the field of digital media. Hidden Florence, is a collaboration with industry-leaders in GPS-triggered city audio tours Calvium Ltd, to create an idiosyncratic guide to Renaissance Florence in the form of a mobile phone App. You can download the App free from AppStore or Google Play. You can also watch a short film about the project here. In 2018 a new phase of this project begins, involving exciting collaborations with the National Gallery (London), the Polo Museale della Toscana (Florence) and colleagues at the universities of Toronto and Cambridge. He is also a coinvestigator on the VISTA AR European research project, based at Exeter, to develop, implement and evaluate a range of augmented reality (AR) and virtual reality (VR) experiences for a number of heritage sites in the South West (England) and Brittany (France). From 2014-5 he co-directed a project called 'Understanding Space in Renaissance Italy' funded by the Getty Foundation ‘Connecting Art Histories’ programme and run by Harvard University Villa I Tatti, Centre for the Study of the Italian Renaissance, Florence. In July 2014 he co-led a seminar in Florence for 12 young academics from China and Taiwan who teach Western art and architecture to study Renaissance works first-hand and in October he co-organised a conference at the Harvard University China Centre in Shanghai and Fudan University. The project, in a slightly modified format, was repeated in 2015, and included a conference I co-organised at Nanjing University. At Exeter Fabrizio is the Director of the Centre for Early Modern Studies and is the college director for postgraduate taught programmes. Fabrizio works and has published on the ritual use of public space, urban identity, the representation and perception of community groups within cities, as well as the relations between commercial and residential spaces in Early Modern Italy. New research looks at the street as a social space, the urban iconography that often binds main streets into a coherent whole and the relations between public and private self-representation. This recent work also engages in cross-chronological discussion, linking the themes and issues of concern for the present to those of the past. He was principal investigator for a research project on 'Taverns, locals and street corners', an AHRC funded research project that looked at the public use of urban space across history, from Renaissance Italy to the present day - a collaboration between colleagues from Bath, Exeter (Dr Jane Milling) and Birmingham (Prof Antonia Layard). A short slideshow interview about the project can be seen here. 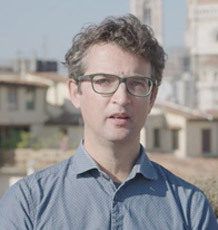 Prior to this, with Dr David Rosenthal, he conducted a research review on cities and urban communities in Early Modern Italy for the AHRC 'Connected Communities' programme. He was also PI on the Street Life network with Dr Georgia Clarke (Courtauld Institute of Art), which engaged with academics as well as well as non HEI partners. A slideshow interview about the project can be seen here. In two recent research projects that have explored the use of mobile phone apps for different aspects of narrative and history, he has worked with specialists in the field of digital media. Writer on the Train, was a collaboration with author James Attlee, and award-winning app-developers Agant to create GPS-triggered experience on the London-Bristol train line; read James on the project in the Bookseller. The other, Hidden Florence, is a collaboration with industry-leaders in GPS-triggered city audio tours Calvium Ltd, to create an idiosyncartic guide to Renaissance Florence. You can download the App free from AppStore or Google Play. Also watch a short film about the project here. In February 2015 he was invited Orion lecturer at the University of Victoria (BC) and gave the keynote at a symposium on digital humanities and art history. He is also supervising a collaborative doctoral award (REACT PhD) with Calvium that is considering 'Geo-locating the spatial and architectural history of pre-modern cities’. From 2018 he is also a coinvestigator on the VISTA AR European research project, based at the Business School at Exeter, to develop, implement and evaluate a range of augmented reality (AR) and virtual reality (VR) experiences for a number of heritage sites in the South West (England) and Brittany (France). From summer 2014 he is co-directing a project called 'Understanding Space in Renaissance Italy' funded by the Getty Foundation ‘Connecting Art Histories’ programme and run by Harvard University Villa I Tatti, Centre for the Study of the Italian Renaissance, Florence. In July 2014 he co-led a seminar in Florence for 12 young academics from China and Taiwan who teach Western art and architecture to study Renaissance works first-hand and in October he co-organised a conference at the Harvard University China Centre in Shanghai and Fudan University. The project, in a slightly modified format, was repeated in 2015, and included a conference he co-organised at Nanjing University. Fabrizio welcomes applications for topics relating to the social and cultural history of Late Medieval - Early Modern Italian cities (1350-1600). He is interested in interdisciplinary topics to do with the ritual use of public space, urban identity, the representation and perception of community groups within cities, as well as the relations between commercial and residential spaces, surveillance, natural disasters and Renaissance cities. He is also interested in topics that would address specific cities from interdisciplinary points of view, and continues to have a specialist research interest in the art and architecture of Siena. A parallel research interest looks at digital humanities in relation to site-specific narrative and the ways that geo-locative technologies can redefine research questions regarding the history of public space, and facilitate public engagement with it. Fabrizio worked with colleagues at the National Gallery in London, on the exhibition Renaissance Siena: Art for a City (October 2007- January 2008). His research on 'Street Life' and the more recent 'Taverns project' have involved various forms of consultation and engagement with policy advisers, think tanks, local authorites and other interest groups, as well as a theatre company and sound artists. Some of this work has been funded by the AHRC 'Connected Communities' programme. His most recent projects have involved a collaboration with digital creative partners in the creation of mobile phone apps. These apps are aimed at a wide audience of the general public and can be downloaded for use. Hidden Florence, is a collaboration with industry-leaders in GPS-triggered city audio tours Calvium Ltd, to create an idiosyncartic guide to Renaissance Florence in the form of a mobile phone App, published in August 2014. You can download the App free from AppStore or Google Play. You can also watch a short film about the project here. Since 2018 he is a coinvestigator on the VISTA AR European research project, based at Exeter Business School, to develop, implement and evaluate a range of augmented reality (AR) and virtual reality (VR) experiences for a number of heritage sites in the South West (England) and Brittany (France). Fabrizio is book reviews editor (pre 1800) for the Open Access journal Architectural Histories (formerly newsletter of the European Architectural Historians Network), and is a regular contributor of book reviews to various journals including the Burlington Magazine. He is a member of the AHRC peer review college, and has conducted peer review work for the Italian research assessment (ANVUR) and the European ERC for art/architectural history. Areas of innovation in his work are around the value of cross-chronological discussion between past and present, as shown in a number of recent funded research projects. Most recently he has also explored the value of dynamic, GPS-triggered historical research and dissemination in the form of mobile phone apps applied to urban social and cultural history of Renissance cities (Hidden Florence). This promises to open up entirely new areas for engagement and research.